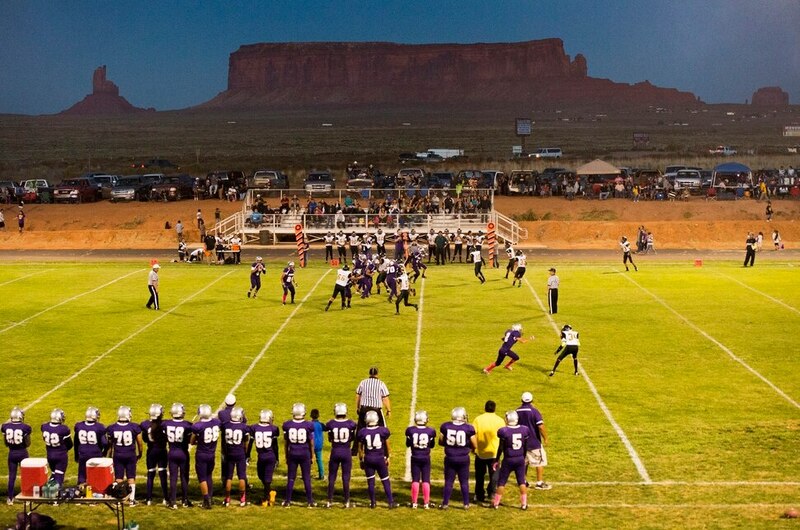 Rick Egan | The Salt Lake Tribune The Monument Valley Cougars play on the most picturesque field in the state. The diversity of Utah’s high school football fields and experiences make game night a special experience at every school. Whether the food offerings that can include chickens roasting on gigantic spits, looking down on sunsets or small-town pride, each school offers something only it can call its own. Thus, attempting to select 10 unique settings from one end of Utah to the other can be daunting. There is hardly a “generic” football stadium in the state. But here are 10 of the best places to experience a high school game based on more than 50 years covering prep sports in the state. (Scott Sommerdorf | The Salt Lake Tribune) Duchesne and Carbon play as a family watches from a hilltop near the Carbon High football field. 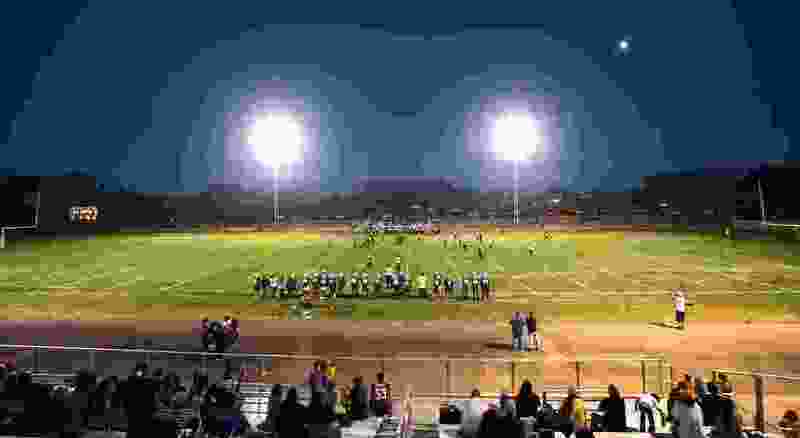 The Eagles would go on to an easy 35-0 win against Carbon High which ran their winning streak to 37 games, setting the Utah state record for consecutive wins, Friday, September 6, 2013. 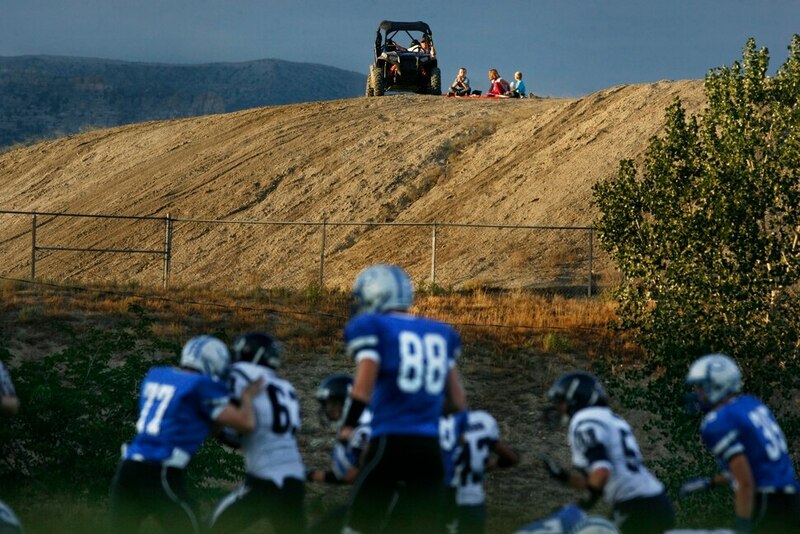 (Scott Sommerdorf | The Salt Lake Tribune) Three young Carbon High fans watch from a hillside on the home team's side of he field as Duchesne was crafting a 35-0 win against Carbon High to run their winning streak to 37 games, and setting the Utah state record for consecutive wins, Friday, September 6, 2013. (Scott Sommerdorf | The Salt Lake Tribune) Duchesne head coach Jerry Cowan talks with his team after pre-game drills. 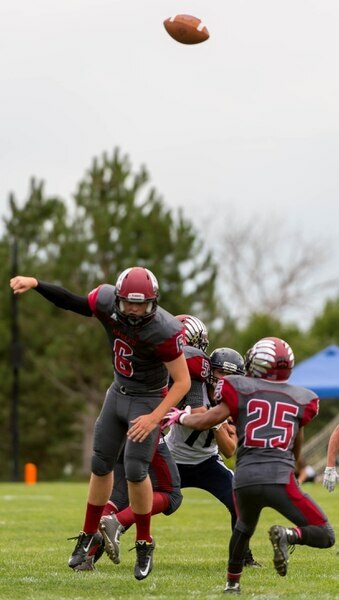 The Eagles would go on to an easy 35-0 win against Carbon High which ran their winning streak to 37 games, setting the Utah state record for consecutive wins, Friday, September 6, 2013. While the Dinos have struggled to win games in recent years, the stadium itself is striking. It sits in a little bowl with a tall mountain on the north. (Rick Egan | The Salt Lake Tribune) Skyline Football field Wednesday, August 8, 2017. (Rick Egan | The Salt Lake Tribune) Skyline Football field Wednesday, August 8, 2017. (Rick Egan | The Salt Lake Tribune) Skyline Football field Wednesday, August 8, 2017. (Rick Egan | The Salt Lake Tribune) Skyline Football field Wednesday, August 8, 2017. (Rick Egan | The Salt Lake Tribune) Skyline Football field, Wednesday, August 8, 2017. (Francisco Kjolseth | The Salt Lake Tribune) The sun sets on a smoky sky as Hurricane players wait their turn to battle Skyline during the season opener at Skyline on Thursday, Aug. 20, 2015. Couple one of the state’s winningest programs with scenery, and the atmosphere at Skyline is difficult to beat. 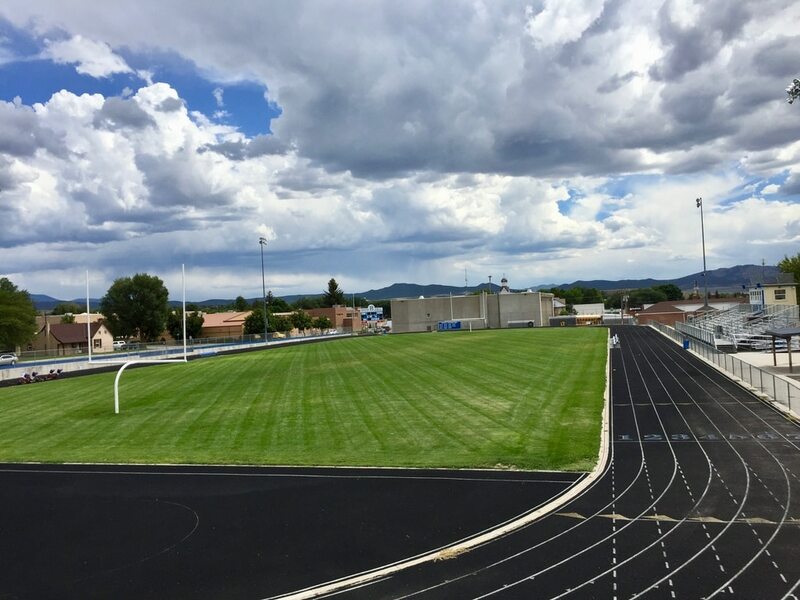 “The Nest” — the school’s student section — faces east toward Grandeur Peak and Mount Olympus. Visiting fans are treated to views of the Salt Lake Valley. The recent addition of food trucks that park on the north end of the stadium makes seeing a game here even better. (Scott Sommerdorf | The Salt Lake Tribune) The school's mascot greets visitors on their way to the stands at Weber High ... (Scott Sommerdorf | The Salt Lake Tribune) The 50 yard line leads to a view of the stands at Weber High football field, ... (Scott Sommerdorf | The Salt Lake Tribune) Weber High football field, Wednesday, August 9, 2017. 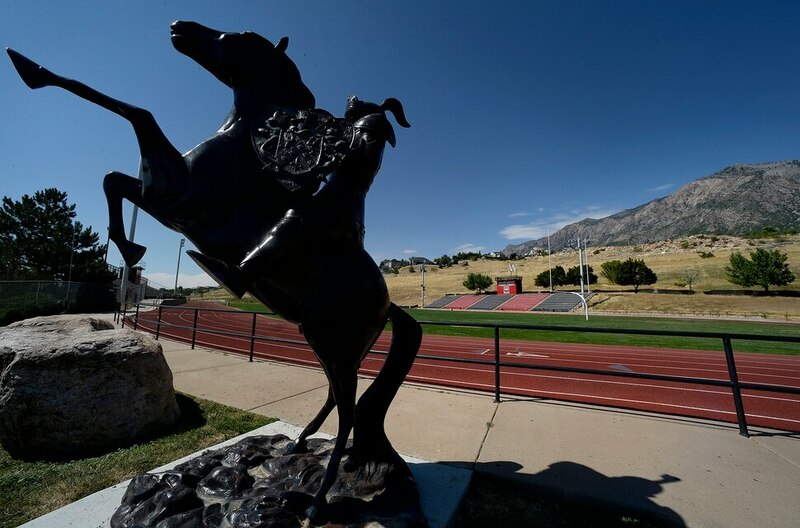 (Scott Sommerdorf | The Salt Lake Tribune) The school's mascot greets visitors on their way to the stands at Weber High football field, Wednesday, August 9, 2017. (Scott Sommerdorf | The Salt Lake Tribune) The 50 yard line leads to a view of the stands at Weber High football field, Wednesday, August 9, 2017. (Scott Sommerdorf | The Salt Lake Tribune) Weber High football field, Wednesday, August 9, 2017. It’s hard to know where to look when at this field high on the northeast bench of Weber County. 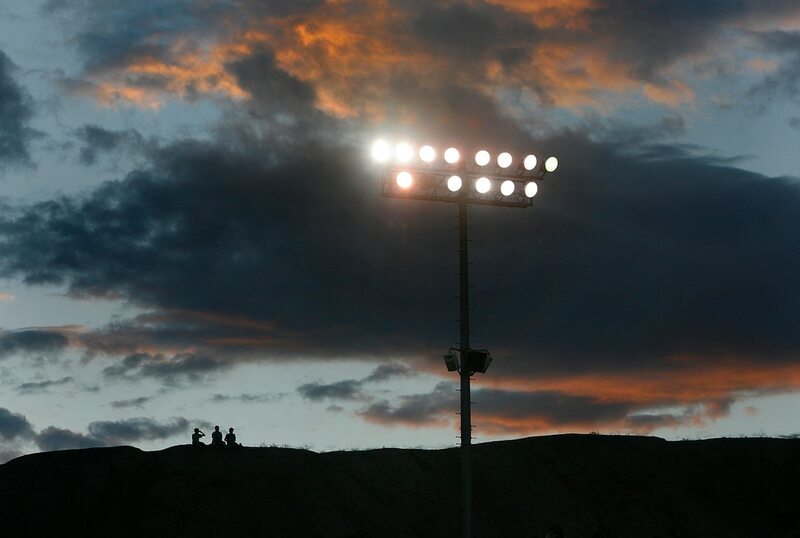 Fans can see the Great Salt Lake and the lights of Ogden, Roy, Fremont, Ben Lomond and Bonneville stadiums. Look in the other direction and they can view Ben Lomond Peak, quite a sight late in the season when its top is coated with snow. (Rick Egan | The Salt Lake Tribune) Judge Memorial football field ,Wednesday, August 8, 2017. (Rick Egan | The Salt Lake Tribune) Judge Memorial football field ,Wednesday, August 8, 2017. (Rick Egan | The Salt Lake Tribune) Judge Memorial football field ,Wednesday, August 8, 2017. (Rick Egan | The Salt Lake Tribune) Judge Memorial football field ,Wednesday, August 8, 2017. McCarthey Stadium always was a good place to see a game, but a major rebuilding effort made it even better. Both home and visiting fans sit on steep bleachers on the east side of the field. From there, they can look down on the lights of the state’s capital city. A long tradition and dedicated fans who have supported the Bulldogs for generations add to the atmosphere. Trent Nelson | The Salt Lake Tribune Layton Christian quarterback Grayson Jackson loses a very high snap while facing Duchesne, high school football in Layton Thursday August 21, 2014. 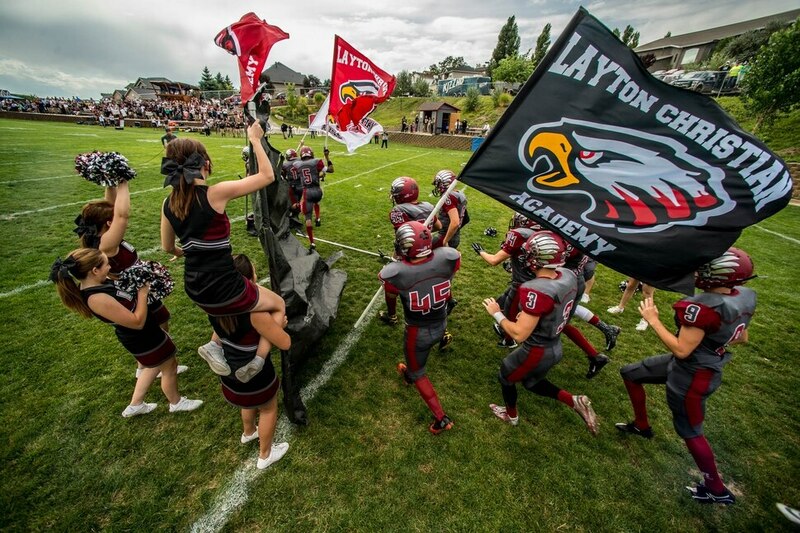 Trent Nelson | The Salt Lake Tribune Layton Christian takes the field for their home opener, hosting Duchesne, high school football in Layton Thursday August 21, 2014. 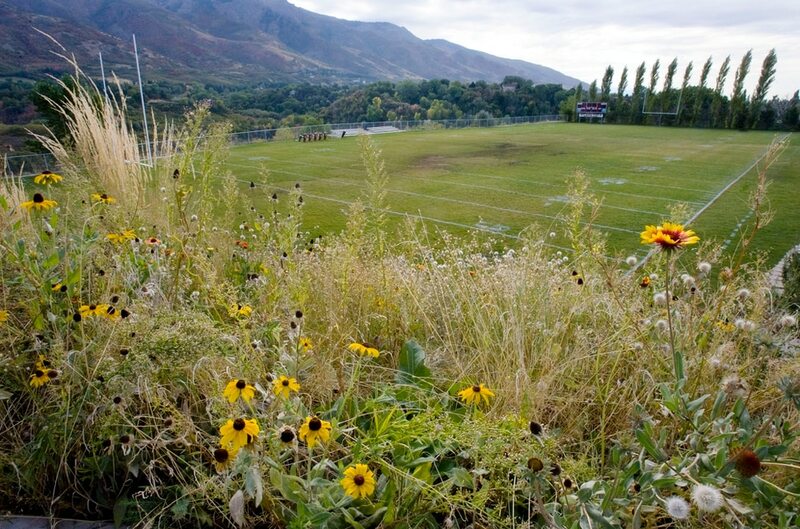 (Steve Griffin | The Salt Lake Tribune) The Layton Christian Football field is tucked into the mountain side in Layton Monday, October 11, 2010. (Steve Griffin | The Salt Lake Tribune) The Layton Christian Football field is tucked into the mountain side in Layton Monday, October 11, 2010. The big schools don’t know about this field near Hill Air Force Base, but it is a wonderful place to watch football. The field sits at the bottom of a natural bowl. In September, fans can sit in the home stands and look east at mountains bathed in fall colors. And since this is the rare school that hasn’t installed lights, they can enjoy them under the sun. (Rick Egan | The Salt Lake Tribune) Highland football field,Wednesday, August 8, 2017. (Rick Egan | The Salt Lake Tribune) Highland football field,Wednesday, August 8, 2017. (Rick Egan | The Salt Lake Tribune) Highland football field,Wednesday, August 8, 2017. (Rick Egan | The Salt Lake Tribune) Highland football field,Wednesday, August 8, 2017. (Rick Egan | The Salt Lake Tribune) Highland football field,Wednesday, August 8, 2017. (Scott Sommerdorf | The Salt Lake Tribune) Olympus players stream onto the field after stopping Highland to end the game.... (Chris Detrick | The Salt Lake Tribune) The artificial turf football field at Highland High School Friday July 3, 2015. (Chris Detrick | The Salt Lake Tribune) The artificial turf football field at Highland High School Friday July 3, 2015. (Chris Detrick | The Salt Lake Tribune) The artificial turf football field at Highland High School Friday July 3, 2015. (Chris Detrick | The Salt Lake Tribune) The artificial turf football field at Highland High School Friday July 3, 2015. (Chris Detrick | The Salt Lake Tribune) The artificial turf football field at Highland High School Friday July 3, 2015. (Rick Egan | The Salt Lake Tribune) Highland football field,Wednesday, August 8, 2017. (Rick Egan | The Salt Lake Tribune) Highland football field,Wednesday, August 8, 2017. (Rick Egan | The Salt Lake Tribune) Highland football field,Wednesday, August 8, 2017. (Rick Egan | The Salt Lake Tribune) Highland football field,Wednesday, August 8, 2017. (Rick Egan | The Salt Lake Tribune) Highland football field,Wednesday, August 8, 2017. (Scott Sommerdorf | The Salt Lake Tribune) Olympus players stream onto the field after stopping Highland to end the game. Olympus defeated Highland 5-3 in a defensive battle at Highland, Friday, August 26, 2016. 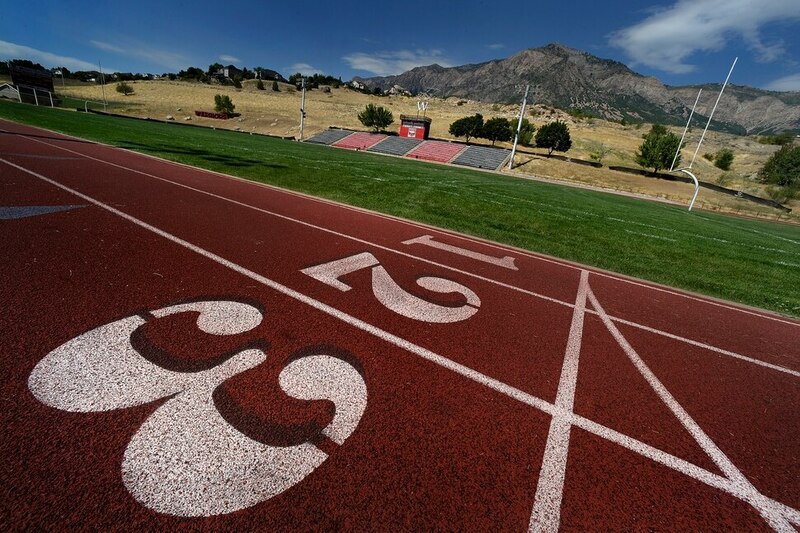 (Chris Detrick | The Salt Lake Tribune) The artificial turf football field at Highland High School Friday July 3, 2015. (Chris Detrick | The Salt Lake Tribune) The artificial turf football field at Highland High School Friday July 3, 2015. (Chris Detrick | The Salt Lake Tribune) The artificial turf football field at Highland High School Friday July 3, 2015. 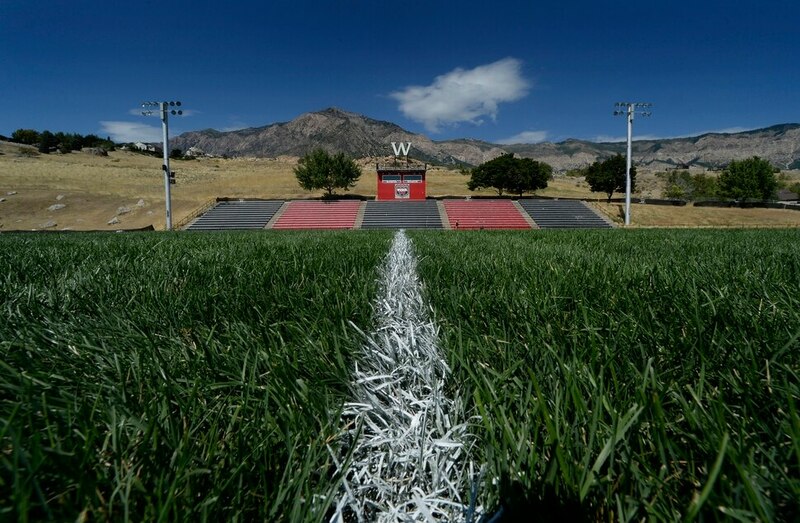 (Chris Detrick | The Salt Lake Tribune) The artificial turf football field at Highland High School Friday July 3, 2015. (Chris Detrick | The Salt Lake Tribune) The artificial turf football field at Highland High School Friday July 3, 2015. This is another Salt Lake County school. The home stands are steep. They are built into the side of a hill. With Sugar House Park to the west, the view of the Salt Lake Valley and sunset is hard to beat. Add to that iconic painted cement H/H letters that kids love to slide down and a food truck tradition, and this is a good place to enjoy a game. This might seem like a strange choice at first. This isn’t an especially scenic stadium. What makes it cool is that it’s located on Main Street, right in the heart of town. Most of the stands are on the west side, allowing fans to park their pickup trucks on the north and east sides, where they watch the games sitting in lawn chairs inside the truck beds. It also doesn’t hurt that a strong football tradition keeps interest high. (Steve Griffin | The Salt Lake Tribune) A view from the bleachers of the Cyprus High School football filed Wednesday, Octo... (Steve Griffin | The Salt Lake Tribune) The Cyprus High School football filed Wednesday, October 13, 2010. (Steve Griffin | The Salt Lake Tribune) A view from the bleachers of the Cyprus High School football filed Wednesday, October 13, 2010. (Steve Griffin | The Salt Lake Tribune) The Cyprus High School football filed Wednesday, October 13, 2010. 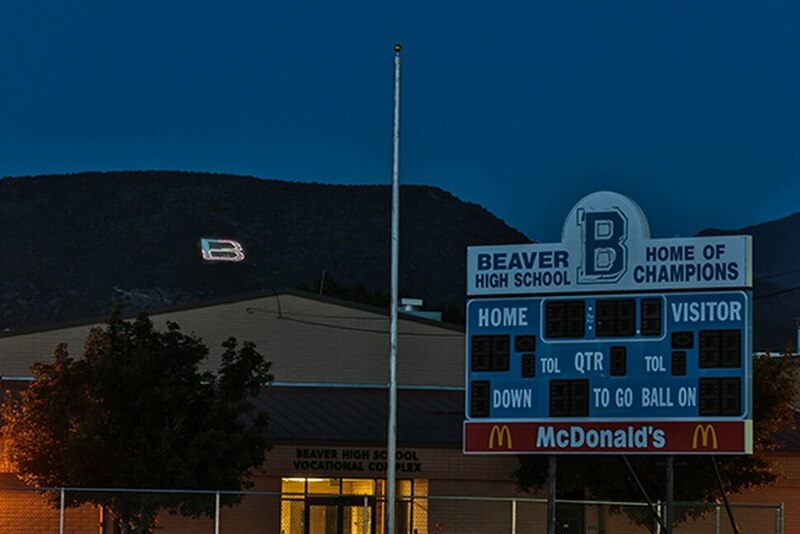 Located in Magna on the far west side of the Salt Lake Valley, this stadium sits at the base of the Oquirrh Mountains, where a large “C” overlooking the school often is lit. The ancient light standards, probably provided by Kennecott Copper years ago — the school was one of the first to have lights — give it an old feeling. What adds to the atmosphere is Magna’s small-town community feeling. Win or lose, the town supports the Pirates. (Scott Sommerdorf | The Salt Lake Tribune) Brighton mascots playfully ran off with cheerleaders as Brighton hosted rival B... (Scott Sommerdorf | The Salt Lake Tribune) Brighton WR Simi Fehoko catches this pass during second half play. Brighton bea... (Scott Sommerdorf | The Salt Lake Tribune) Brighton DB Dylan Pearmain leaps to intercept a pass in the end zone intended f... (Scott Sommerdorf | The Salt Lake Tribune) The nearly full moon rises just ahead of kickoff at Brighton. Jordan led Bright... (Scott Sommerdorf | The Salt Lake Tribune) Bingham players during pre-game warm ups under a rainbow as Brighton hosted riv... (Scott Sommerdorf | The Salt Lake Tribune) Bingham player practice under the threatening weather as Brighton hosted rival ... (Leah Hogsten | The Salt Lake Tribune) Brighton High School leads Herriman High School 9-7 at the half during the 2015 sea... (Scott Sommerdorf | The Salt Lake Tribune) Bingham player practice under the threatening weather as Brighton hosted rival ... (Scott Sommerdorf | The Salt Lake Tribune) The game between 5A rivals Brighton and Bingham was halted for thirty minutes e... (Leah Hogsten | The Salt Lake Tribune) Herriman's Jake Jutkins makes a touchdown in the second quarter. Brighton High Scho... (Leah Hogsten | The Salt Lake Tribune) Brighton celebrates what they thought was a team interception. Brighton High School... (Leah Hogsten | The Salt Lake Tribune) Brighton High School leads Herriman High School 9-7 at the half during the 2015 sea... (Rick Egan | The Salt Lake Tribune) Brighton football field, Wednesday, August 8, 2017. (Rick Egan | The Salt Lake Tribune) Brighton football field, Wednesday, August 8, 2017. (Rick Egan | The Salt Lake Tribune) Brighton football field, Wednesday, August 8, 2017. (Rick Egan | The Salt Lake Tribune) Brighton football field, Wednesday, August 8, 2017. (Rick Egan | The Salt Lake Tribune) Brighton football field, Wednesday, August 8, 2017. (Rick Egan | The Salt Lake Tribune) Brighton football field, Wednesday, August 8, 2017. (Rick Egan | The Salt Lake Tribune) Brighton football field, Wednesday, August 8, 2017. (Rick Egan | The Salt Lake Tribune) Brighton football field, Wednesday, August 8, 2017. (Rick Egan | The Salt Lake Tribune) Brighton football field, Wednesday, August 8, 2017. (Scott Sommerdorf | The Salt Lake Tribune) Brighton mascots playfully ran off with cheerleaders as Brighton hosted rival Bingham in a 5A game played Friday, September 26, 2014. (Scott Sommerdorf | The Salt Lake Tribune) Brighton WR Simi Fehoko catches this pass during second half play. Brighton beat Syracuse 35-14 in a 5A first-round playoff game at Brighton, Friday, October 31, 2014. (Scott Sommerdorf | The Salt Lake Tribune) Brighton DB Dylan Pearmain leaps to intercept a pass in the end zone intended for Syracuse WR Dax Harris during second half play. Brighton beat Syracuse 35-14 in a 5A first-round playoff game at Brighton, Friday, October 31, 2014. 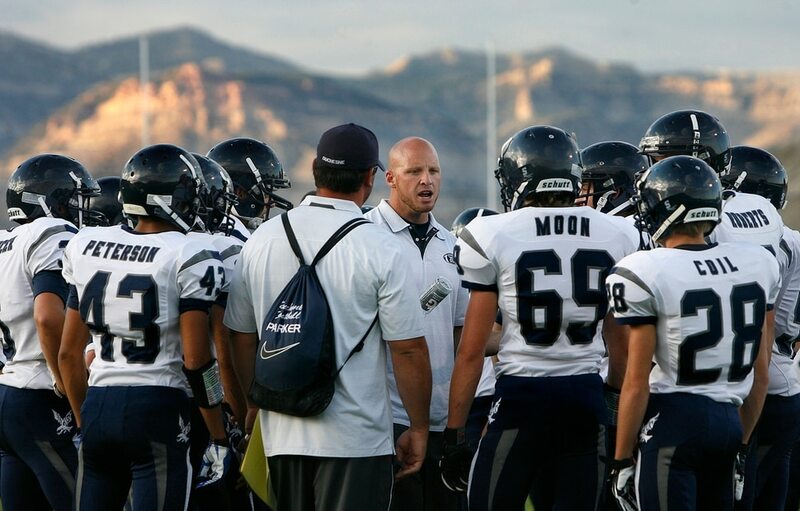 (Scott Sommerdorf | The Salt Lake Tribune) The nearly full moon rises just ahead of kickoff at Brighton. Jordan led Brighton 34-21 at the half at Brighton Friday, September 25, 2015. A total lunar eclipse of a Supermoon will begin on the evening of September 27th. 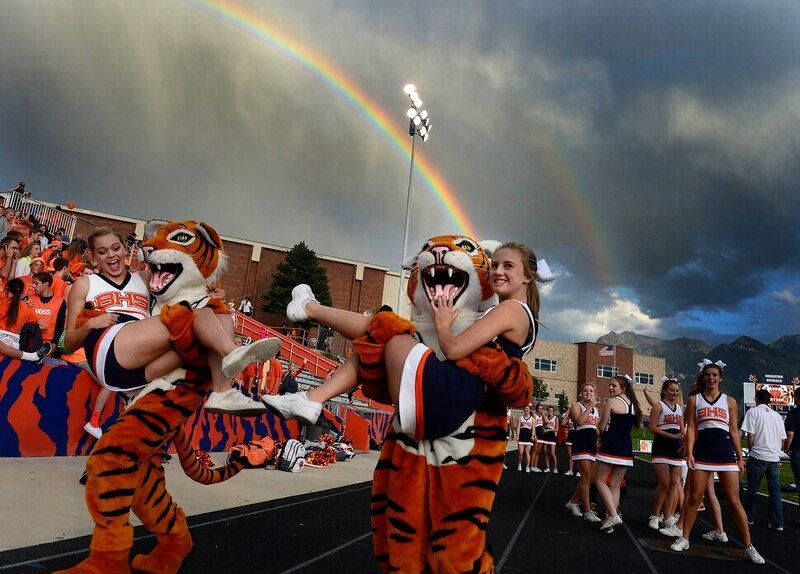 (Scott Sommerdorf | The Salt Lake Tribune) Bingham players during pre-game warm ups under a rainbow as Brighton hosted rival Bingham in a 5A game played Friday, September 26, 2014. 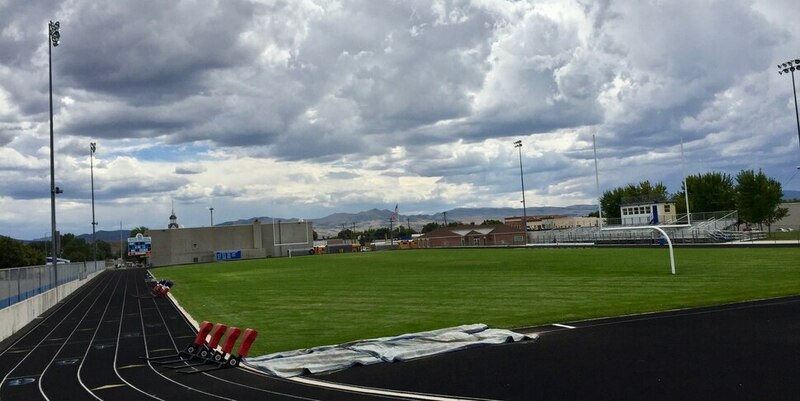 (Scott Sommerdorf | The Salt Lake Tribune) Bingham player practice under the threatening weather as Brighton hosted rival Bingham in a 5A game played Friday, September 26, 2014. The game was halted for thirty minutes in the first half due to lightning in the area. (Leah Hogsten | The Salt Lake Tribune) Brighton High School leads Herriman High School 9-7 at the half during the 2015 season opener at Brighton High School, Friday, August 21, 2015. (Scott Sommerdorf | The Salt Lake Tribune) Bingham player practice under the threatening weather as Brighton hosted rival Bingham in a 5A game played Friday, September 26, 2014. The game was halted for thirty minutes in the first half due to lightning in the area. (Scott Sommerdorf | The Salt Lake Tribune) The game between 5A rivals Brighton and Bingham was halted for thirty minutes early in the first half as a lightning storm rolled through, Friday, September 26, 2014. (Leah Hogsten | The Salt Lake Tribune) Herriman's Jake Jutkins makes a touchdown in the second quarter. Brighton High School leads Herriman High School 9-7 at the half during the 2015 season opener at Brighton High School, Friday, August 21, 2015. (Leah Hogsten | The Salt Lake Tribune) Brighton celebrates what they thought was a team interception. Brighton High School leads Herriman High School 9-7 at the half during the 2015 season opener at Brighton High School, Friday, August 21, 2015. (Leah Hogsten | The Salt Lake Tribune) Brighton High School leads Herriman High School 9-7 at the half during the 2015 season opener at Brighton High School, Friday, August 21, 2015. (Rick Egan | The Salt Lake Tribune) Brighton football field, Wednesday, August 8, 2017. (Rick Egan | The Salt Lake Tribune) Brighton football field, Wednesday, August 8, 2017. (Rick Egan | The Salt Lake Tribune) Brighton football field, Wednesday, August 8, 2017. (Rick Egan | The Salt Lake Tribune) Brighton football field, Wednesday, August 8, 2017. (Rick Egan | The Salt Lake Tribune) Brighton football field, Wednesday, August 8, 2017. (Rick Egan | The Salt Lake Tribune) Brighton football field, Wednesday, August 8, 2017. (Rick Egan | The Salt Lake Tribune) Brighton football field, Wednesday, August 8, 2017. (Rick Egan | The Salt Lake Tribune) Brighton football field, Wednesday, August 8, 2017. (Rick Egan | The Salt Lake Tribune) Brighton football field, Wednesday, August 8, 2017. This is one of the few fields that faces east-west. That creates an alley with a view of most of the Salt Lake Valley for fans on both sides of the stadium. It’s possible to see the lights from other fields all over the valley on a clear night. When a storm is rolling in, watching the lighting from the stands is inspiring. And the view of the Wasatch Front isn’t bad, either. (Rick Egan | The Salt Lake Tribune) The Monument Valley Cougars play their homecoming game against the Newcomb Skyhawks from New Mexico, Friday, September 25, 2015. (Rick Egan | The Salt Lake Tribune) The Monument Valley Cougars play their homecoming game against the Newcomb Skyhawks from New Mexico, Friday, September 25, 2015. A national magazine a few years ago said there were five football stadiums to visit in the U.S. before dying. They included Lambeau, the Big House in Ann Arbor, Death Valley, Notre Dame and…Monument Valley. The independent Navajo team’s stadium faces toward its famous namesake. As the sun sets behind the stands, the formations almost glow in the dark. Add Navajo tacos in the concession stand, and attending a game on the Utah-Arizona border is not to be forgotten. What's the best venue in Utah to watch a prep football game?